The body of the man who jumped into the Potomac River this weekend to retrieve a fishing rod has been found, police said Tuesday morning. Bniamin Adel Rastkheez, 31, died after he jumped off his boat near Piscataway Park about 5 p.m. Sunday and was caught in the current, Maryland Natural Resources Police said. The Falls Church, Virginia, resident was on the water in a 16-foot Stingray motorboat with two friends when a fishing rod went overboard. Rastkheez went to retrieve it and then tried to get back to the boat. But the current was too strong, according to the U.S. Coast Guard. Rastkheez disappeared after his friends were unable to help him. He was not wearing a life jacket, police said. The Coast Guard and police from multiple jurisdictions used seven boats and a helicopter to search for Rastkheez. Police said Monday that they believed he had drowned. 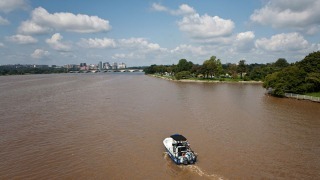 The calm surface of the Potomac can hide dangerous currents, officials warn.